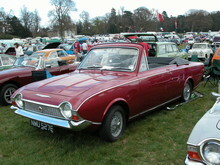 Ford introduced two new 2.0 litre versions of its Corsair in 1967, the 2000 and 2000E. A larger (1996cc) V4 engine powered both cars and improved the performance of the Corsair considerably. Like the Cortina 1600E the 2000E featured special trim, a vinyl roof, a wooden facia and extra "2000E" badges. Sales for the Corsair were never as strong as the Cortina range but nether the less, Ford continued to sell both the 2000 and 2000E Corsair until 1970. Practical Classics Spring 1994 - Featuring Buyers Guide Family Soft-Tops. Click Here to view in our shop. 8' 5" 4' 2" 14' 11" 5' 3" 0 (20) 0' 0"